Scalper Bot 1000 Review - Scam Bot Doesn't Work! 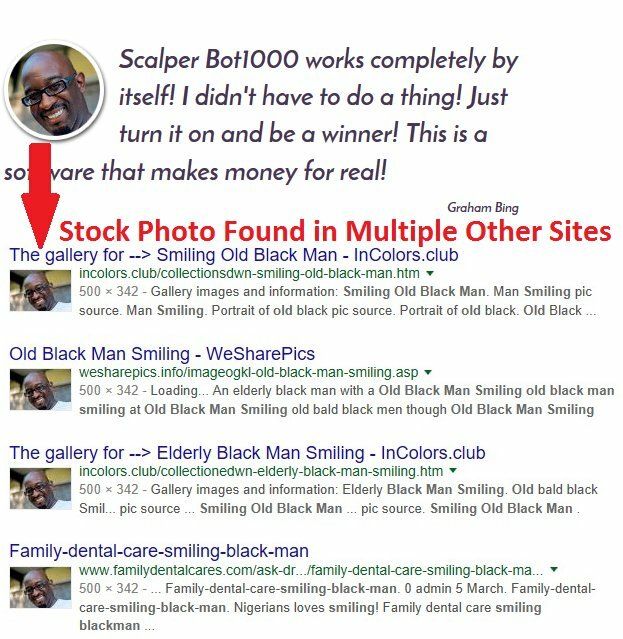 Scalper Bot 1000 scam by Kevin Bright promises to make its users at least $1000 a day by scalping, but it doesn’t work. 3 of my readers deposited a couple hundreds of dollars and lost all of it within 24 hours. If you are still hesitating to fund your trading account, make sure you read this Scalper Bot 1000 review first – where I disclose the terrible experience of my readers, and expose how the bot makes money off you. Over the past 2 years, I have reviewed more than 100 binary trading softwares, and none of them have made money for the members. Today, we add Scalper Bot 1000 to the list. 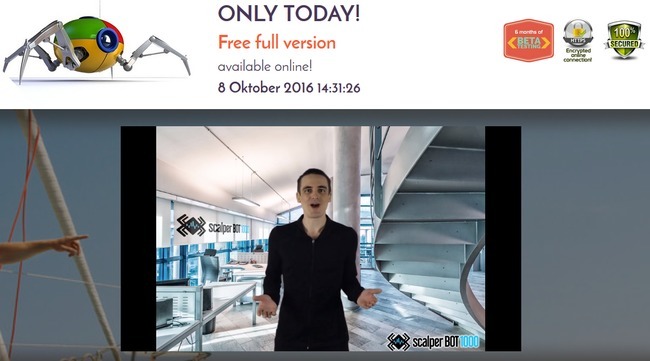 Just like any other trading systems, Scalper Bot 1000 claims to be a miracle trading software that can generate huge profits on autopilot for its members. Not only that, you’ll be able to get started for absolutely free, so most victims don’t realize they have been scammed until they lost all their trading deposits (which is already too late). This scenario has happened over and over again, each time with a different binary trading robot. These systems primarily target inexperienced internet users, who don’t have any experience with binary options. In fact, binary options is a very risky trading instrument that sees over 95% of its users lose money. It is so risky that even Forbes warns us against gambling on binary options. To understand why scalping doesn’t work with binary options, we first have to understand how binary options work. Binary options traders mainly rely on “trading hunch” to make their trading decisions. They guess if an asset’s price will rise or fall after a short period of time, usually between 30 seconds to minutes. Let’s say I think that the price of AAPL stock will rise 1 minute later, and I bet $50 on a 1-minute options contract. If I’m right, I win a certain percentage of what I bet, usually 60% to 80%. But if I’m wrong, I lose the entire $50 that I bet. As you can see, the entire process of trading binary options is not that different from traditional gambling. There’s no way to predict market movement in such a short period of time as it is random. Even if you manage to win 50% of the time, you’ll still lose money due to the imbalanced winning vs losing payout. It’s just like risking $50 for a chance to win $40, in a coin toss game. To make things worse, Scalper Bot 1000 employs the strategy of executing a lot of trades in a short period of time, hoping to make quick profits. This means that you’ll have a lot of open positions at the same time and utilize high margin to trade. Even though Kevin claims that his software uses trading algorithms to get into winning trading positions, in reality the bot will only generate a series of random trades for you. I have readers who lost more than their initial deposits, thereby triggering margin calls from their brokers to top up more fund into their trading accounts. You can lose more than you have with binary options. With that said, I’ve collected some evidence that can help you sniff out scams like Scalper Bot 1000 without having to pay for it. Let’s take a quick look at them. Below the sales video, you can see a couple of member testimonials, complete with their pictures and names. Knowing that majority of online scams fabricate fake member testimonials, I ran a background check on each and every featured members of Scalper Bot 1000. Unsurprisingly, I found all of the members fabricated from either stock photos or stolen pictures from the internet. Take “Adal Klose” as an example (screenshot above). The picture can be traced to shutterstock, a vendor website that sells royalty-free images online. These stock photos can be bought by anyone and used for advertising purposes without copyright issues. 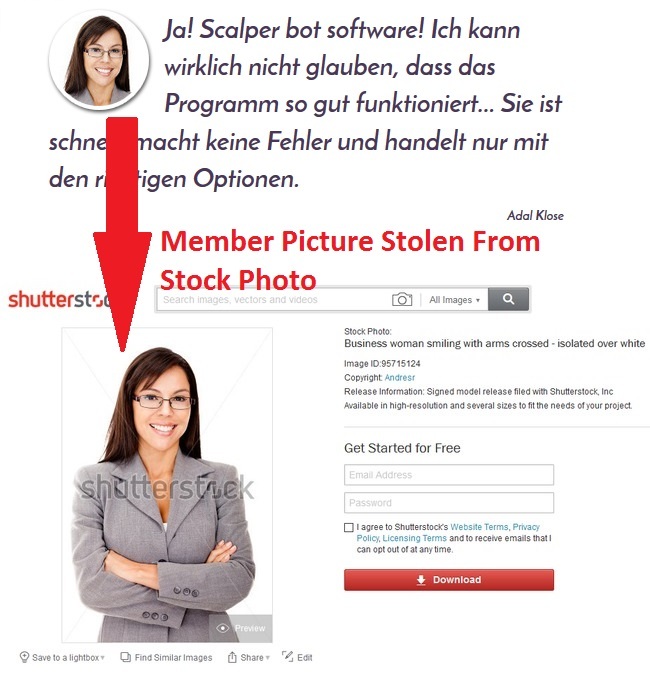 In this case, the scammers behind Scalper Bot 1000 simply used the picture to generate a fake testimonial. The same goes to “Graham Bing”, in which the same picture can be found in multiple unrelated websites (screenshot below). Don’t be deceived by this common scam tactic. No one is making money with the app, as evidenced by the huge losses of my readers. Besides, if there are real members who are satisfied with the performance of the software, Scalper Bot 1000 wouldn’t have to fabricate fake members to promote the scam. As much as the scammers want to keep you in the dark, they have to reveal the true nature of the scam somewhere within the website to protect themselves from lawsuits. The truth can be found in their risk disclaimer, where it acts as the legal document and narrates how the scam actually works. You can’t find the document anywhere within their sales material, because it is supposed to be hidden from you. It can only be found through a fine print that reads “earnings disclaimer” at the bottom of their sales page. You can authenticate the terms quoted in above screenshot against the original disclaimer here: scalperbot1000.co/disclaimer. Self explanatory – despite giving you multiple promises, Scalper Bot 1000 denies their guarantee of $1000 daily profit using their disclaimer. Even though Scalper Bot 1000 is advertised as a one-click auto-trading software that handles everything for you, somehow your earning potential is entirely dependent on your own techniques. Once again, Scalper Bot 1000 scam retracts the guarantee they have given to you in the sales materials. If you decide to sign up for Scalper Bot 1000 app, you will be required to open a new broker account with their partner brokers, which are unregulated by monetary authorities. The losses are pocketed by the broker, which is then shared with its partner-in-crime – the scammers behind Scalper Bot 1000 system. SCALPER BOT 1000 IS A SCAM. I strongly advise you to stay away from the scam if you don’t want to lose your hard-earned money.